Join the Cannavino Library at Marist College in recognizing Banned Books Week for the first time at Marist this September 23rd through the 29th! The annual Banned Books Week event celebrates everyone’s unhindered right to read. Join us for Banned Book Bingo and Uncensored Readings! 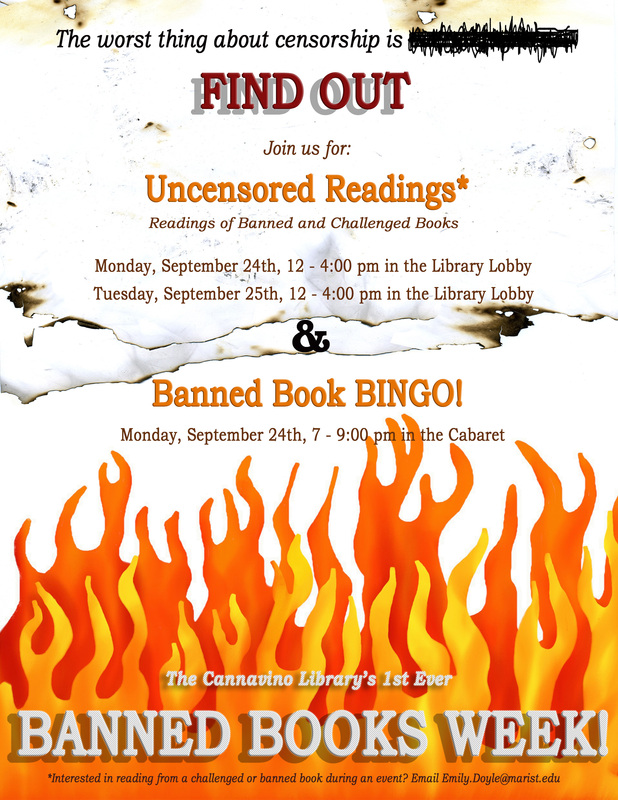 Banned Book Bingo will take place on Monday, September 24th, 7 – 9:00 pm in the Cabaret and Uncensored Readings will be on Monday, September 24th and Tuesday, September 25th from 12 – 4:00 pm in the Library Lobby. If you would like to get involved as a reader, please email Emily.Doyle@marist.edu. Also, don’t forget to check out a book this month from our Banned Books display that will be on the main floor of the library during Banned Books Week!